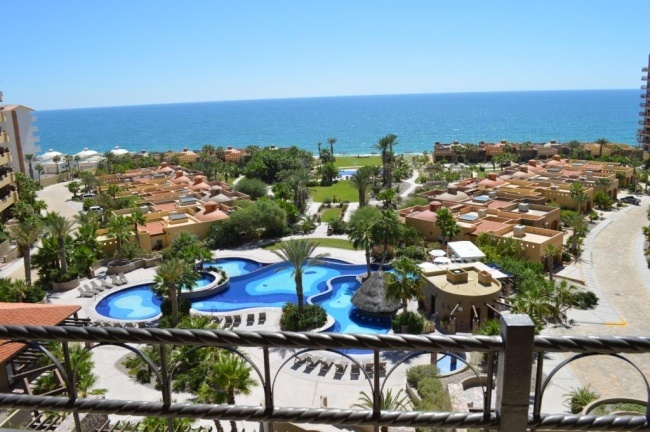 During a recent trip to Puerto Peñasco, Mexico I had the opportunity to stay a couple nights at Bella Sirena Resort. The resort sits on 14 acres located on a stretch of sand known as Sandy Beach; just a couple miles away from the old port. Driving to Rocky Point from the United States is easy and well-marked and can be reached from San Diego, California in less than six hours. Mexican Highway 3 from Mexicali leads almost right to the front entrance. Check-in was in a small office just outside the tall iron gates. Once inside the hand-laid cobblestone roads give the resort a feel of exclusivity and old world Mexican charm. Five, 9-story buildings sit close to the beach and one, two and three bedroom condos are for rent and for sale. 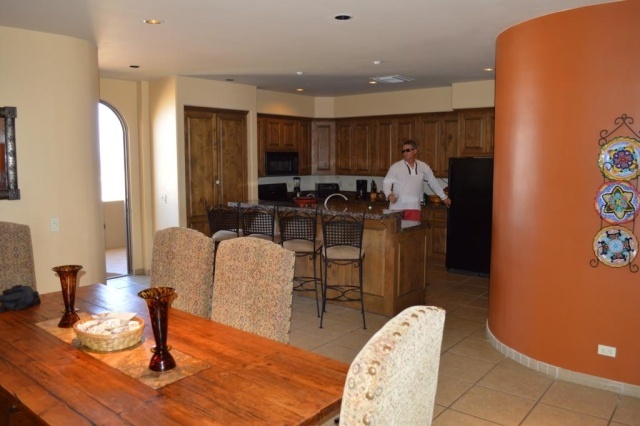 Larger villas of up to five bedrooms are located on the beach and around four beautifully tiled vanishing edge pools that rival those in Cabo San Lucas, and offer satisfying relief from the hot desert sun. 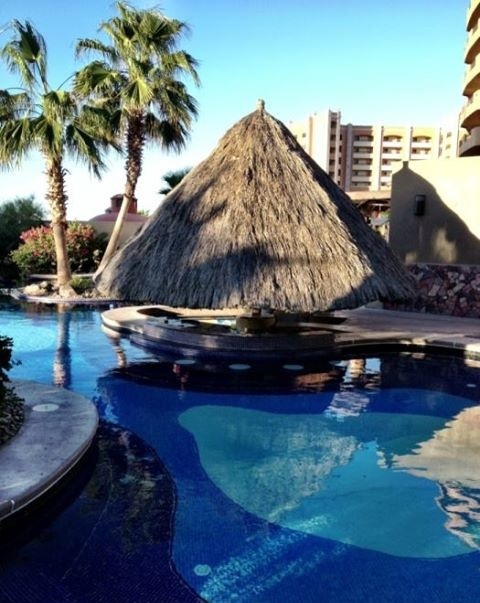 The landscaping is beautiful with lush green grass and native desert fauna that is meticulously maintained. I stayed on the fifth floor in a two bedroom condo that was immaculate and provided all the comforts one would need. Every rental is individually owned so no two are the same. The rental I stayed in had décor that was perfectly appointed; comfortable queen and king sized beds as well as oversized couches filled the space. High ceilings, recessed fans and tile floors all added to the already unexpected space. The showers were big and the deep, round bathtub in the master bedroom had a private ocean view. Everything from high speed internet, flat screen HD TV’s and air conditioning worked without failure or incidence. The kitchen was fully equipped and ready for entertaining. The balcony was huge and outdoor seating and tables were nicely placed. 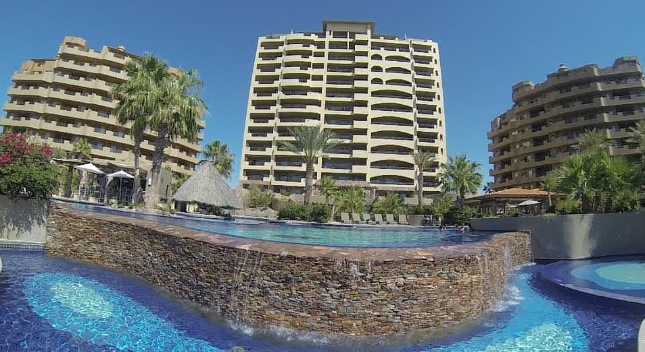 The view from the balcony across from the pools and out to the Sea of Cortez was crystal clear and blue. The main pool has a swim-up bar with a small restaurant called Azul. The price of food and drinks was more than reasonable and the staff was fun and attentive. 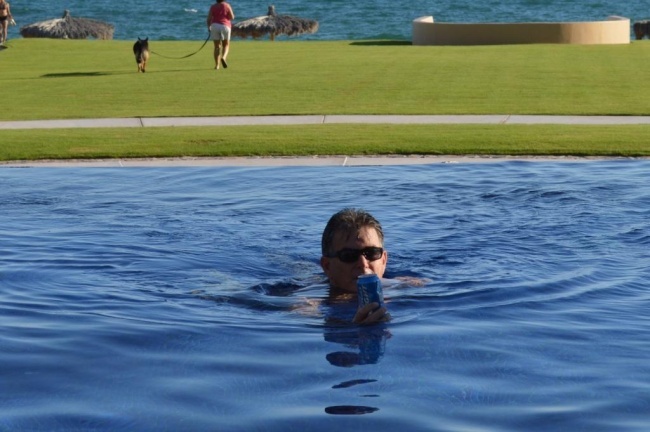 I spent most of my time submersed up to my shoulders in the pool closest to the beach enjoying the view of the Sea of Cortez and the warmth of the wind on my face. I visited Bella Sirena Resort at the end of the off season and the rates were fantastic. Even during peak season, October to May, staying here won’t do any damage to your wallet. Expect to pay three to five times more for a stay in a comparable ocean front resort in the United States. Editors Note: We would like to thank Seaside Mexico for the complimentary stay for our write and photographer while in Rocky Point. 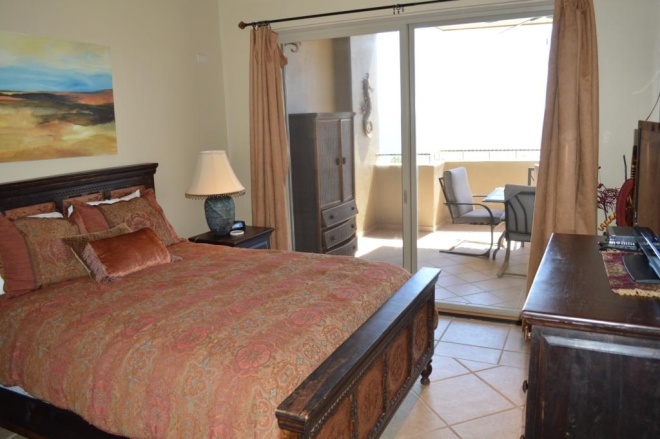 If you are looking for a vacation rentals in Puerto Penasco, please consider Seaside Mexico. MexicoVisitor was lucky enough to catch up with an interesting couple living in colonial town of Alamos, Sonora. 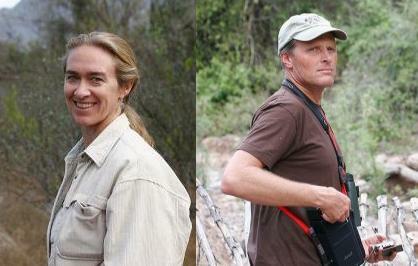 Jennifer & David MacKay are the owners of Solipaso Tours and their new project, El Pedregal Nature Lodge & Retreat Center. Read all about their experience of living and working in one of Mexico’s historic gems and an eco-tourism hotbed. 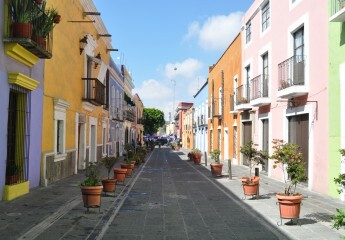 MexicoVisitor: Tell us about your first experience in Mexico and how did you end up in Alamos, Sonora? Jennifer & David MacKay: We had both travelled to Mexico in our younger years, to the Yucatan and to the Baja…But, our lives in Alamos began through a family connection. David’s step-father and mother had purchased an amazing old building, La Ciudadela…one of the oldest buildings in this historic silver mining town. In 1994, we drove from CA to Alamos to visit them and were enchanted with the beauty and way of life in Alamos. On our drive back to CA we decided we were going to move to Alamos for a while. David quit his job at Backroads Bicycle Tours and I continued on at the same place as a trip leader (with a very flexible schedule). We were fortunate to be able to live in the enchanting La Ciudadela. It is a whole city block with many rooms, courtyards, fireplaces and more. We worked on fixing up that place and eventually turned it into a small inn. We also explored the area by foot, bike and car and then started leading tours in the area. After 10 years in that location, we moved to another place which we turned into a restaurant/café and a three room inn. Around that time, we purchased the land we now live on, called El Pedregal. We have 20 acres of beautiful land on the edge of town and we have created El Pedregal Nature Lodge and Retreat Center. We raised our two daughters here, who went all the way through the public school system and are now both going to college in the USA. It has been a great place to live, raise a family and work for ourselves. We’ve now been in Alamos for 18 years and it is very much home for us and our girls! MexicoVisitor: What is the idea behind Solipaso? Jennifer & David MacKay: We started Solipaso as a way to work legally in Mexico and encompass all of the various things we do. We offer a variety of local trips, including birding outings and a float trip on the Rio Mayo. We also run birding and natural history trips throughout Mexico. 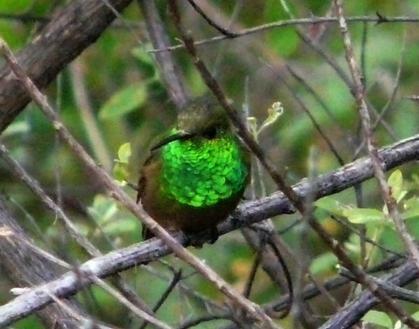 On the international market of birding tour companies we are very small, owner-operated and specializing in Mexico. We also have our hotel, which offers lodging and meals. In addition, we also do a lot of custom trips and itineraries for people visiting Mexico with an emphasis on birding. Solipaso is owned and operated by us and we very fortunate to have several local guides here in Alamos as well as in other areas we travel. MexicoVisitor: Solipaso is a leader in the conservation of your area, how has the local response been to your work? Jennifer & David MacKay: Solipaso isn’t so directly involved in conservation, although we are involved in promoting ecotourism which is a way of getting people informed about and involved in conservation. We, as individuals, work directly in conservation in a couple of ways. Jennifer is working with the conservation project, Rancho Ecologico Monte Mojino (which is a project of Nature and Culture International). This project focuses on purchasing and protecting tropical deciduous forest. 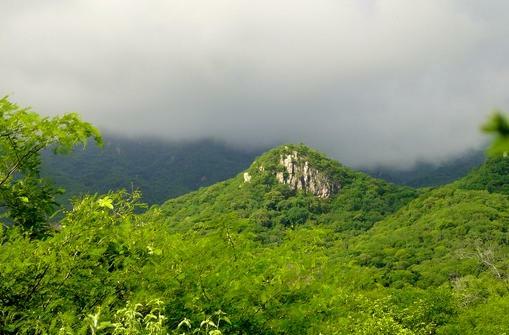 They have focused on ranches that are important for the conservation of the Rio Cuchujaqui watershed. All of the land lies within the federal reserve, known as the Area de Proteccion de Flora y Fauna Sierra de Alamos-Rio Cuchujaqui, overseen by CONANP. Essentially, NCI is creating a reserve within the reserve. This conservation effort is understood and supported by some in the area and others are still trying to understand why conservation is necessary. The local tradition of cattle ranching is very much a part of the campo culture and land is there to be used for grazing. Part of the ongoing effort of the project is to slowly lead by example and show the upsides of conservation. We are actively trying to get more scientific research done on the land and also trying to involve the local community in conservation projects that somehow benefit them. We have the strong support of CONANP. The hills surrounding Alamos are amazing! Jennifer is also involved in a big project to create a big city park and green space for Alamos. It is called Parque La Colorada and it will be a 300 acre park and it’s three main focuses will be recreation, education and conservation. A group of people is helping with the project and a Mexican non-profit has been formed to oversee it. We are in the process of raising the funds for the purchase of the land (and are half way there!). We have tax deductible status in the USA for all dollar donations and we are in the process of getting donatario status in Mexico for the same. This park will be another place to highlight the importance of taking care of the land and our environment. MexicoVisitor: We noticed your other project; El Pedregal. What is it? Jennifer & David MacKay: El Pedregal is our newest encantation in Alamos. We purchased 20 acres of land right on the edge of town and have created a beautiful place for people to come visit. 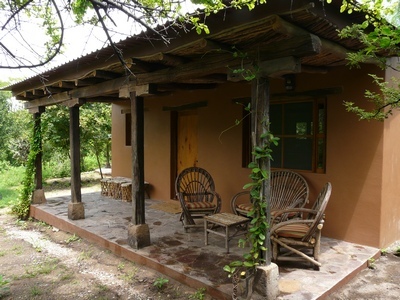 On the land we have a main lodge around which we’ve built 5 guest casitas (rooms). We also have an big outdoor palapa and barbeque area, a great place for events of all kinds. And, there is a strawbale building on the property, which is Jennifer’s yoga studio and massage room. It is also a space that is very suitable for events, presentations, talks, parties, etc…On the land, we have a couple miles of trails which are good for a walk, run or birding. The land has been cattle free since 2005 and the habitat is getting really good! The regenerative capacity of this forest is amazing! So, we are also doing some conservation work here by simply showing how dense the forest can be and how close to the surface ground water can be when you remove cattle. 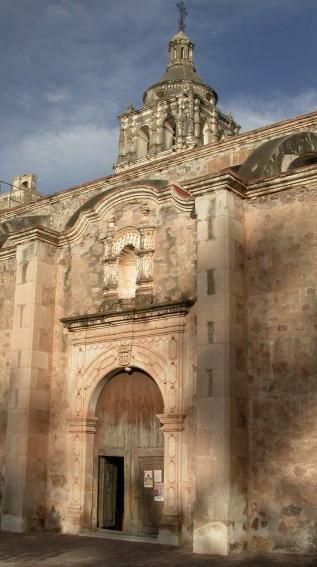 MexicoVisitor: Alamos is a colonial gem hidden in the hills of Sonora, tell us a little more about it? What’s the draw for visitors? Jennifer & David MacKay: Alamos is, indeed, a very special place to visit and to live. It is like visiting ‘real’ Mexico. Although tourism is one of the main industries, Alamos is not a very touristy place….there are several things to do for visitors, but I think it’s main draw is that it is a very relaxing place to be. It’s a great place to come and get out of the rat race and the fast paced life that so many people live. We have many guests that arrive with a long list of things they want to do. After a couple days, they start to relax and the days become very mellow! But there is plenty to do as well. We have a great museum. Every Saturday there is a wonderful Home and Garden tour that takes visitors to 3 different restored haciendas. It’s a great way to learn more about the beautiful architecture and about the different people who live here. The proceeds of that tour go to the local scholarship fund. Solipaso runs a great day long float trip to the Rio Mayo, which is great for all ages, abilities and interests. The village of La Aduana lies a few miles away…it is the home of the original silver mines and is now a very little town surrounded by ruins of the old silver mining boom. The church there is 100 years older than the one in Alamos. It’s also a great place to pick up a few locally made crafts. Walking around town and exploring the town is also a favorite activity! There is a variety of places to eat, from taco stands to great Mexican food to fancy international fare. MexicoVisitor: Everyone is concerned about safety in Mexico, how’s your neck of the woods? Jennifer & David MacKay: Todo tranquilo aqui! There is a great deal made about safety in Mexico…especially in the US media. The reality is so much different than what they portray. We travel all over Mexico, going to remote places and we’ve never had anything but good experiences. Of course, one never hears about all the good stuff going on. Alamos is very safe…and I would say that Mexico is safe for visitors. The violence is very targeted, much like gang wars. There is not random violence like you see in the USA. They don’t have metal detectors at schools here…the good life goes on in Mexico and we encourage everyone to visit! Here in Sonora, our young daughters drive back and forth from the USA regularly and I actually feel safer for them when they are in Mexico because people here are good and helpful. There are many elderly women that live in Alamos that drive back and forth to Tucson by themselves. Mexicans are traveling all over this country without incident. It is safe and all is well. If you are involved with the shady side of life, then you might have some trouble! Otherwise, it’s safe! Of course, we use the same street smarts and precautions traveling here as we use traveling anywhere else in the world, including the USA! MexicoVisitor: Is there anything else you would like our reader’s to know about you, Solipaso and/or Alamos? Jennifer & David MacKay: We really like to help people have a great experience when they visit us here in Alamos or travel with us on our bird tours. Since we run all aspects of our business, we are able to give very personal attention and customized service. We love Mexico and it shows through our work and what we do. MexicoVisitor: How can we reach you?